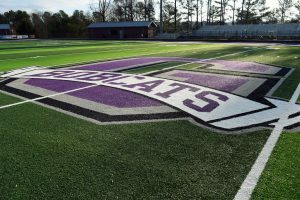 Synthetic turf provides improved drainage and wear resistance to extend the amount of time fields are available for play, but there are some trade-offs. The two biggest issues that are being addressed by the industry are force reduction and heat. Synthetic turf intends to imitate a well maintained natural grass field. The core design it uses to accomplish this, green polyethylene fibers and black rubber, also contributes to its temperature shortcomings. The temperature on these fields can rise as high as 175 degrees. The good news is Technology Advancements and Research are leading to better turf systems and solutions that can help improve the temperature issue. Natural grass blades transpire which means they release water vapor that has an evaporative cooling effect. Green synthetic fibers, on the other hand, absorb UV heat and transfer it to the black crumb rubber. The rubber acts as a heat sink, trapping the heat and increasing the temperature of the field. 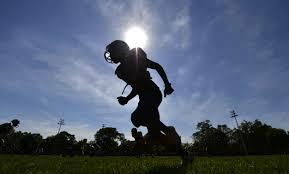 The sun has a far greater impact on field temperature than air temperature or water. A period of cloudy skies or even a brief rainstorm can bring the temperature down significantly, but minutes later with more solar exposure, a field with traditional infill returns to its previous high. The synthetic turf industry has made a mad dash to invent, discover, or technique its way to cooler fields. Long fiber turf systems developed in the early 90’s, were designed around cheap and freely available recycled rubber. The delicate issue is that crumb rubber serves an important role providing force reduction in turf systems and does so at a very inexpensive cost compared to alternatives. Be mindful of additional costs for irrigation, grooming and reapplication. If an owner pays $500,000 for a synthetic turf field and spends another $200,000 maintaining the cooling layer over time, was it really a $500,000 field or a $700,000 field? Remember that most warranties do not cover the cooling additive or guarantee field temperature reduction. The new fad in synthetic turf is to top dress the field with a layer of Organic Material or Alternative Infill over crumb rubber that does not absorb as much heat. Now that “cooling technology” has become one of the most talked about criteria for selecting a new synthetic field vendor, some manufacturers recite the pros and omit the cons. Top dressing works, but the benefit only lasts 1-2 years. Cleat interaction with the infill quickly blends the cooling layer with black rubber beneath, removing the barrier to UV sunlight. Some top dressing solutions use “hydrophylic chemical reactions” which require significant and costly irrigation or use extruded cork which floats and migrates requiring significant and costly grooming maintenance. There are such things as cooling solutions that last the lifetime of the field. There are fibers available that are extruded with an additive which reflects UV, reported to cool fields by about 10%.Technology is pushing new infill choices that can provide as much as a 40 degree cooler field surface. Adding a shock pad beneath the synthetic turf system provides better force reduction than crumb rubber and opens the door to infills such as hypoallergenic natural walnut and Zeolite, a mineral also used in water filtration equipment. These systems also produce additional evaporative cooling from the occasional rainstorm, although they do not require irrigation. In evaluating field cooling options, don’t base your decision on the price on day one. The cost of ownership over the lifetime of the field balanced with the real benefit of the set of solutions you are purchasing, should drive that decision. Our advice is to engage an expert that constructs these fields not the Manufacturer. Don’t let the salesman fool you by claiming to be a construction company, talk to your local Certified Field Builder (CFB). At the end of the day, you wouldn’t hire a carpet company to build your house; Why would you hire one to build your stadium.